What are the travel possibilities for Echternach? Travel by car is another possibility. I would like to book a single room. How do I do that? Please inform us in the remark field about the name of the person sharing the double room with you. If you would like to book a single room, please insert ”single room” in the remark field. How is the weather – do I need to bring warm clothes? The climate in Luxembourg during September can be summarized as mild and reasonably dry. Daytime maximum temperatures average around 19°C, whilst at night 10°C is normal. Do I need gala-clothes or practical outfit for the official opening reception on Thursday and for the dinner Saturday evening? Casual dress will be more than sufficient for all evening events including the closing dinner on Saturday. Is there a time for delegates to return to the hotel before the afternoon programmes? No, but there will be a return to the hotels on Saturday before the closing dinner. How many kms shall we walk on Friday and Saturday afternoon? There will be an easy short walk and a more demanding walk. Description of both walking options and inscription for one of the walks will be done after 31st of July. I am coming with my car – is it possible to park it at the hotel? Price? All our hotels have free parking facilities, except Hostellerie de la Basilique in Echternach. I want to stay in Luxembourg before or after the conference. Can you suggest what to do and where? Click here to discover Luxembourg's different museums, tours, activities and local products. I will arrive to Echternach 1 day before the conference. Where/how do I book the room at the hotel? What is the price for a single room/double room? Via e-mail As a delegate, please register for the regular dates and make a request per mail for pre- or post-conference bookings. If I stay in a hotel out of Echternach, how can I reach the ERA group for the program? The accommodations in our packages are mainly located in Echternach. For accommodations located in the surroundings (Scheidgen, Berdorf, Beaufort), shuttle services are organized according to the ERA program. The conference price includes: accommodation, all meals including gala dinner, excursions, entrance fees, transport during the conference and transfer to/from the airport and Luxembourg main Station and Trier Hbf. How can I make the registration and when? How do I pay the conference fee? The packages are online and bookable under http://www.mullerthal.lu/en/home/era-meeting-2018. Every participant will get an invoice after his registration on the website. Full payment will be requested until the end of July. Are there any cancellation conditions? The organizer reserves the right to cancel a reservation if payment has not been made within the term of payment. How can I choose my accommodation? If my favorite accommodation will be full, how do I register to the other one? In each of the three packages several hotels are bookable. Your booking request will be subject to availability within the chosen package. Your hotel choice will be respected as much as possible. Is it possible to exchange money at the airport? Currency in Luxembourg is €uro. Yes, there is an exchange bureau at the airport. Click here to view the airport map (exchange office = 11). At Luxembourg main station currency exchange is offered across the street at ING Bank. What is the conference package price? How can I go from those places to Echternach and back again? We offer free shuttle bus service on September 27th and September 30th from/to Luxembourg Airport. Public transport information can be found under http://www.mobiliteit.lu. List of Car Rental Companies at Luxembourg Airport can be found under https://www.lux-airport.lu/passengers-visitors/plan-your-trip/car-hire/ . Taxis are available at the airport / train station, but can be quite expensive. Echternach has no train station, we offer free shuttle bus service on September 27th and September 30th from/to Luxembourg Central Station and Trier-HBF. Will there be someone at the airport/at the train station to help me? Yes, a hostess will welcome you. Furthermore, you will get a mobile hotline number. My companion wants to participate in the dinners and tours like the delegate. How is the registration then? Do I need to bring walking boots as a delegate? The program includes excursions where hiking boots are required. What is the price at the hotel for a beer or a bottle of wine? What is the price of a bottle of water – or is it possible to drink the tap-water? Tap water is safe to drink everywhere in Luxembourg. What is the typical souvenir from Luxembourg? The Grand Duchy produces excellent sparkling wines (crémant), wines, spirits, liqueurs and beers. Other regional products include chocolate, various sweets, but also honey, jams and even Luxembourg-made mustard. Additionally, you’ll find a broad selection of handcrafted items, from candles and ceramics to textiles and design objects. Luxembourg is also well known for its talented jewellers and watchmakers. What is the best e-mail-address to use if I want to get in contact with you about the conference? Where can I find tourist-information about Echternach? How many inhabitants are in the town? 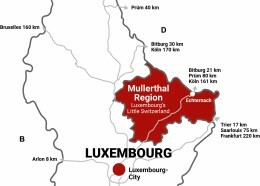 Echternach is the historical and cultural center of the Mullerthal Region - Luxembourg's Little Switzerland as well as the oldest city of Luxembourg with 5.600 inhabitants. Will it be possible to walk on an E-path in connection with the conference? Walking the E2 and E3 is part of the program.